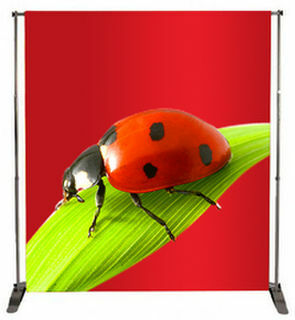 Standard, or deluxe pull up/roller banners for indoor display plus an outdoor roller banner. The teardrop shape is perfect for both retail and outdoor events/promotions. The feather or bow shape flag is perfect for promoting outdoor events. A complete range of bases to fit our teardrop and feather flags. Popular rectangular flags that allow more room for your message plus a new shape of sail flag. Promote your event with a high impact PVC banner. 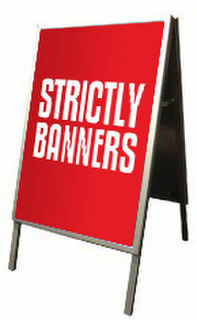 Our banners are printed on 550gsm coated PVC and come with hemming and eyelets. 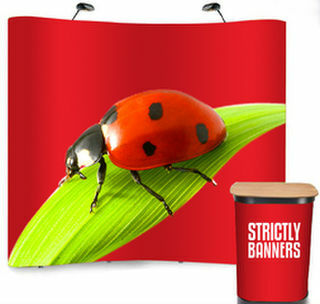 Our pop up banner walls are very affordable and offer high impact trade show signage that is sure to stop foot traffic. Each wall comes with halogen light and trolley case with optional graphics. Economical wall solutions for use as a backdrop. 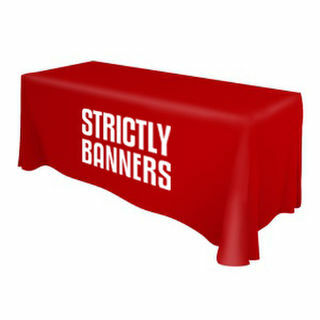 Knitted polyester table cloths available in a range of sizes. A range of display solutions designed specifically for outdoors. Attract outdoor or indoor foot traffic with a footpath stand such as an A frame or heavy duty outdoor display solution. This is the outdoor equivalent of an indoor roller (pullup banner). Graphic size is 2m high x 800mm wide. It comes with a waterbase and 2 x PVC prints.